(so cute and cased from Pinterest from, Cecile Ortiz – love it! So that completes my wall banner for this month! Here is another look at how it turned out! Here is my St. Patrick’s Day “Wall Art” banner that I came up with. My idea is that I leave the ribbon up every month and then have velcro on my ribbon with the opposite velcro piece on my squares so it is very easy to take off and put on new squares every month. I created the shamrock using the Heart Thinlets die, the Festive Flower Builder Punch, and the Itty Bitty Accents Punch Pack. The saying is from a retired SU set. I used the 2-1/2 Circle punch for the “pot”, the Word Window punch for the lip, and the 2-3/8″ scallop punch for the gold and rainbow, punched out of gold glitter paper and silver glitter paper which I sponged for color. The letters were from the retired Sans Serif alphabet die and the shamrock and leprechaun are from a retired SU set. This little guy is done using the Build a Bird punch and the large square punch with retired Gumball Green SU ribbon – so cute! The mouth was drawn in. This was just stamped and colored in to complete my St. Patrick’s Day banner – loved how it turned out! Happy St. Patrick’s Day and a huge shout out to my wonderful family in Ireland – we’ll be celebrating with you all on the 17th! Here is my February “Wall Art” project that I created using the January My Paper Pumpkin kit – too cute! If you are a My Paper Pumpkin subscriber, then you received a PDF of this with each individual square – if you would like the PDF and sign up as my Paper Pumpkin subscriber, then let me know and I will be happy to send it to you! 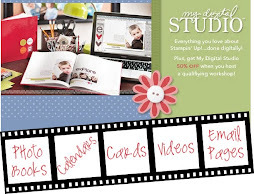 OR if you place a $25 order from my on line store, then I will be happy to send you the PDF too!